Acted before the King and Queene at WHITE-HALL, And sundrie times with great applause at the private House in SALISBVRY Court, By the Prince his Servants. LONDON, Printed by Aug. Mathewes for Richard Meighen, next to the Middle Temple gate in Fleetstreet. 1633. 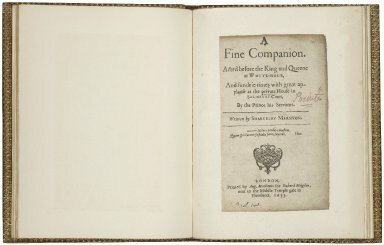 Title page imaged from Folger call number: STC 17442 Copy 2 Bd.w. STC 6518 copy 2. Image is not from the transcribed copy.